Public market investors like to see [fill in the blank]. We could put many adjectives here. Very few seem to correspond with the adjectives often used to describe open source software (OSS) companies. With these data limitations in mind, we offer some preliminary thoughts on developing a framework for evaluating open source models. Open source is a model for developing software. It differs from traditional proprietary models in that open source software is distributed royalty-free along with its source code, which the user can view and modify. This model can be appealing for vendors as it enables both faster innovation to the source code through a community of contributors and faster customer adoption (in part because... well, it’s free). If open source is software, what metrics are important for software investors? For software companies, revenue growth is king. As mentioned in our newsletter on Tuesday, investors buy these stocks primarily on this metric. 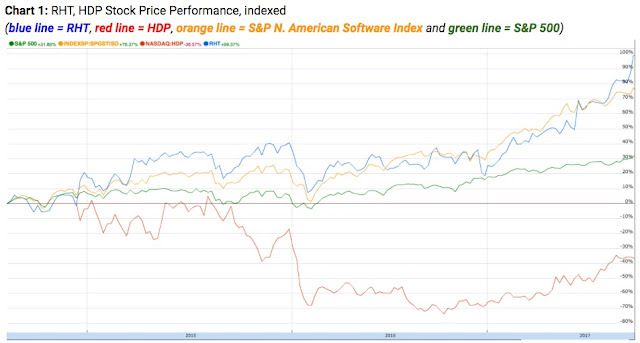 Note that we only look at SaaS companies here as their financial profiles more closely resemble OSS companies versus more established software players like Microsoft and Oracle. Other factors do matter. 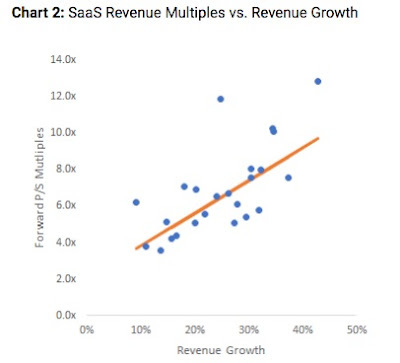 Indeed, Todd Gardner of SaaS capital developed a useful framework for thinking about SaaS valuations here that suggests other important metrics including size of total addressable market, retention rates, operating margins and capital efficiency. For now, at least, expected revenue growth seems to be the most important metric for investors, with ~70% correlation to P/S multiples. How do open source companies fare on these metrics? It depends. Pure play OSS distribution comes with a host of challenges. The first — and perhaps most salient — limitation is that revenue generation (and thus growth and also capital efficiency) is not inherent to a business model where software is distributed royalty-free. Retention rates can also suffer in this model. Accessible source code can make it more difficult to sustain product differentiation and ward off competitors. Further, OSS companies may require frequent capital infusions to fund adequate R&D. 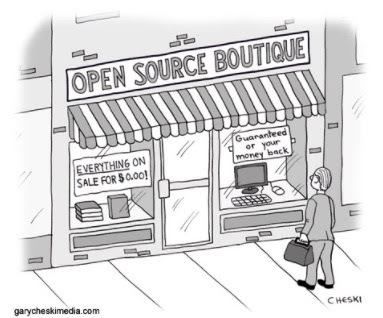 But not all open source business models are alike. Paid support: Here, the underlying software is distributed for free. The vendor charges for consulting, installation and support services to generate revenue. Open core: Definitions for open core can vary. Here, we are defining open core as companies that develop enhancements on top of the original open source code. These extra features are sold commercially. Hybrid open source: Hybrid models integrate proprietary modules with open source code. The proprietary code is commercialized. How do these models stack up? Each model has its merits. Paid support, which is the most pure play OSS model, generally encourages wider distribution as the core product is free. Hybrid models, the most similar to traditional software companies, do not share this advantage. However, this model does adhere more closely to a path that has already been successfully paved to robust revenue; i.e. building a compelling product and charging users for it. What is the market telling us so far on OSS revenue models? As mentioned earlier, analysis of open source valuations is far from conclusive given the small sample set of OSS companies and limited financial histories. 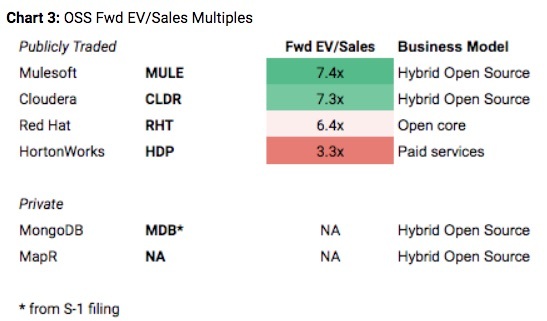 Nevertheless, early signs seem to indicate investors prefer hybrid models, with multiples averaging in the low-7x range on forward sales vs RHT at 6.4x and HDP at 3.3x. Further, hybrids also clock in better than the SaaS sector overall (~6.5x). We note that this may bode well for companies with IPOs on deck — most notably, MongoDB which has a hybrid model and filed its S-1 last month. The fundamental law of corporate valuation is that a company’s worth must be equal to its cash flow prospects; i.e. revenue net of all cash outflows. Notably, only one of the vendors listed above is profitable: RHT. The other business models — though commanding higher relative valuations currently — have not yet been proven. Investors may have placed their initial bets, but it may be too early to call the race for open source. If you enjoyed this report, please check out our Knowledge Center to find sector breakdowns and detailed information on all things private markets, employee benefits and more.